While e-learning is spreading rapidly, many people are concerned that e- learning detracts from the learning process. However, I believe that something different occurs. Our status quo learning method trains us to think about learning in a particular way and resist change. I would like to counter this concern with some experiences from my own life. I grew up in an era when we did not have the Internet, so we learned through reading books, listening to our teachers at school, and doing hands-on activities. As a child I enjoyed learning through reading. When I was around 12 years old, my parents invested in an encyclopedia set. I would spend hours looking through various topics of interest. Today, we have Internet resources like Wikipedia that provide even more content. In fact, Wikipedia has pretty much superseded the encyclopedia. Today, rather than opening up the encyclopedia to find information on a topic like the city of Hong Kong, I go to the Internet and look on Wikipedia. I made the change mentally by making some changes in my life. I purchased a computer and made the decision to pay for a high- speed Internet connection. Because my computer is always connected to the Internet, I could replace my print encyclopedia with Wikipedia in a way that minimally impacted my time. A properly constructed e-learning system, where knowledge is chunked into small segments, greatly facilitates this type of exploratory learning. Like most of you, I went to school and learned through listening to my teachers. The classroom environment is probably one of the most difficult environments in which to learn. Most of us didn’t relish sitting in class; yet we continue to perpetuate this construct. Learning in a traditional classroom environment contains several flaws. First, many people have neither the discipline nor the interest in the topics being taught to stay engaged. It takes a gifted teacher to engage all students in the classroom. Furthermore, students learn at different paces. While some people learn best through listening, the classroom concept may not be the best approach. E-learning allows the student to tackle topics at their own pace. Even though a classroom environment has these flaws, I still hear concerns about the lack of interaction in an online course. I agree that interaction dramatically improves the learning environment. Online training can take advantage of the latest video conferencing technology, like Cisco Telepresence. Telepresence technology allows students and teachers to interact in real time while not being bound by the restrictions of a classroom. Finally, hands-on activities are the most difficult to implement in an e-learning environment. However, I would argue that hands-on activities are losing relevancy to our society. For example, when I got my first car, I learned how to change the tires, change the oil, and make minor repairs. Since our cars have become more complex, these tasks have become harder. The regulatory environment also has impacted these activities, as it is now difficult to dispose of oil and other fluids used in the car. So today, I take my car to the mechanic for most items. The number of people doing hands-on automotive maintenance is down substantially from 30 years ago. This is the case in many fields, including the semiconductor industry. As more work becomes automated, fewer specialists are needed for hands-on work. E-learning is better suited to the new automated environment. Because specialized hardware is expensive to repair and operate, the consequence of learning from mistakes is high. Additionally, most semiconductor manufacturing tasks, including wafer processing, packaging, test, diagnostics, and characterization, are controlled through a software interface that can be easily adapted as an e-learning tool. Thus, software simulations can allow someone to receive the hands-on training experience without the cost. Learning is changing. While many of us prefer the status quo and are suspicious of changes, the changes can be good. E-learning can provide new capabilities and its benefits outweigh its deficiencies. As technologies for reference databases, telepresence conferencing, and software simulations improve, they have the potential to permanently revolutionize the way we learn. This is a design from Ken Wallquist at Philips Semiconductor. This particular design contains two op amps to amplify the IDDQ signal, making it easier to detect small changes in IDDQ. The "D's" in IDDQ refer to the drain-power supply connections that were common in early NMOS circuits. IEEE adopted IDDQ as the terminology associated with quiescent power on an MOS integrated circuit in the 1980s, and this term carried into CMOS circuits as well. This version of the circuit measures the supply current at the ground connection. 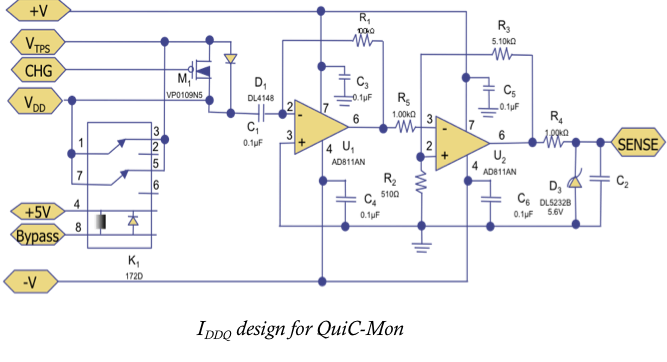 This type of measurement is usually referred to as ISSQ, based off the source-ground connections common in early MOS circuits. 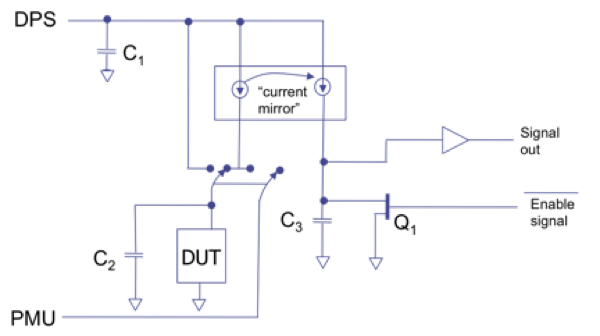 This circuit is based on a Hall effect measurement technique developed by Wayne Needham at Intel in the early 1990s. This is a very low load technique, so it is minimally invasive to the circuit under test. 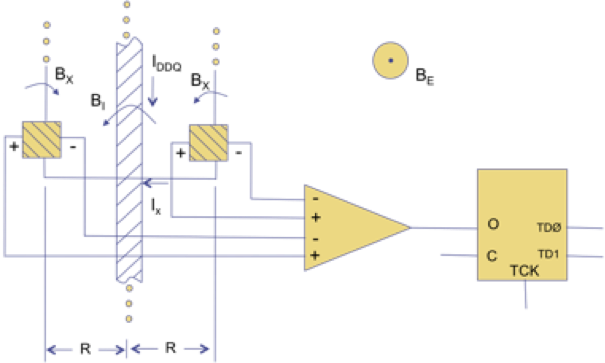 This circuit, developed by Ferguson and Gerson, uses a mirrored current technique to sense IDDQ. It is a high speed technique, capable of making measurements in the hundreds of kilohertz range, and is adaptive, capable of making both precise and large IDDQ measurements. Even though IDDQ is considered a slow technique with limited applicability to today’s ICs, circuits like these, as well as various difference measurement schemes, have extended its usefulness to modern ICs. It is still a very powerful technique for localizing defects that are otherwise very hard to identify through standard digital test techniques. Q: What is the best way to non- destructively check for and isolate bond wire to scribeline shorts? A: A pin-to-pin electrical continuity test in conjunction with the magnetic current microscope, or SQUID microscope, is the best approach for detecting and localizing shorts in a package. While this is an expensive technique (the Neocera Magma SQUID tool runs more than USD 500k), it is probably the best approach, since other techniques like x-ray radiography do not definitively show short locations.